The Relaxonchair RC-MKII is an attractive massage chair that has many of the features present in high end massage chair models. Its design is inoffensive and means that it doesn’t look out of place in a living room or a more professional environment. Its size is also a bit smaller than competing massage chairs so it doesn’t take up a lot of room. The features and massage options it offers make it an extremely reasonable buy. Let’s take a deeper look into what makes the Relaxonchair RC-MKII a good purchase for anyone looking for a well-designed chair with great features and a reasonable price tag. Here’s the Relaxonchair RC-MKII review. The Relaxonchair RC-MKII massage chair measures at 65 inches long, 40 inches tall and 30 inches in width when in its upright position. When it is fully reclined, in its zero gravity position, it occupies a much larger space, as is expected from a chair of this type. So it’s necessary to leave some space behind it wherever it is placed. The Relaxonchair RC-MKII weighs 183 pounds and that makes it one of the lightest massage chairs on the market. The relatively light weight means that it is easy to move around and adjust by a single person. Is the Relaxonchair RC-MKII suitable for tall persons? The Amazon description of this massage chair does not list specifics with regards to the height of person that this massage chair caters to, but customer feedback suggests that people within 6 feet and 280 pounds find it comfortable. So this massage chair certainly does not leave out the larger persons out there. The chair also has a body scan feature that adjusts the chair according to the user’s height and body type. 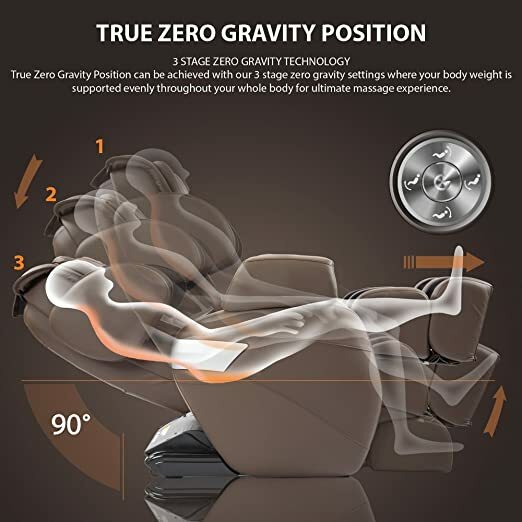 The Relaxonchair RC-MKII is a premium massage chair and so quite expectedly it offers the “zero-gravity” massage options. In this mode the chair is able to recline to an extent in which the user’s torso and legs are completely on the same level as the floor. The chair is also able to perform a full body stretch. The chair employs older L-track roller systems but its massaging capabilities are still extremely competent. The massage chair has programmable massage modes that you can adjust in intensity as your body requires. There are four different massage modes, each offered in three intensity levels. That means that you won’t get bored and every time you use the chair will offer a different massage experience. If you need a gentle massage, the chair will do that for you. If you want a more vigorous massage to wake your body up and get your muscles ready, the massage chair will do that for you as well. Because of the include Shiatsu massage option the chair can massage parts of your body without interacting directly with your muscles. The massaging qualities of this chair also ensure mental relaxation due to decrease in stress levels. Going through the verified buyer reviews on Amazon, it is clear that the Relaxonchair RC-MKII has been well received by its owners. It sits in the market as a premium massage chair with a mid-tier price tag. The massage chair received the full 5 star rating from nearly all of its customers. This rating does not mean the chair is perfect however, and customers who rated it highly said it could certainly do with improvements in some areas. The massaging action of the Relaxonchair RC-MKII has been described by multiple owners to be something that you have to get used to. The massage chair delivers a vigorous massage that may be too firm for some users. But most owners commented that you get used to it after a few sessions. This concern, many believe, could have been avoided if the chair was outfitted with more padding which would lessen the vigor at which the massage is delivered. Overall however the consensus is that the Relaxonchair RC-MKII is able to deliver a reasonable massage experience. Many of the users have complimented the Relaxonchair RC-MKII for its relative lightness and compact size. Some users even said that the massage chair was the lightest one of his collection. This lightness makes the relocation of the chair manageable without exerting yourself too much, an effort that can result in back pain. The Relaxonchair RC-MKII is rated to fit through 36 inch doors, however one owner commented that he could only fit it through his 32 inch door after removing the hinges. The majority of the owners of the Relaxonchair RC-MKII seem to be quite happy with their purchase and have given it a perfect Amazon rating. The relative affordable nature of this chair makes it easy to purchase and enjoy. It has the features of expensive models and offers them in a compact and manageable frame.